This is one of those back-pocket recipes that you pull out when you want something great, without a lot of dishes or fanfare – it’s a good, standby recipe for busy weeknights, Saturday afternoons, or really anytime you want an easy meal that tastes great. 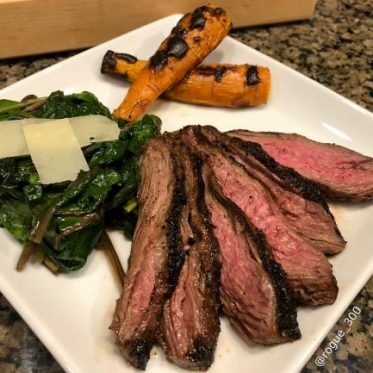 You can turn this into an entree with a side vegetables, or over pasta or salad greens; it’s also just as easily turned into sliced steak sandwiches – your possibilities are virtually endless! Combine olive oil, soy sauce, ginger, garlic powder, black pepper, and rice wine vinegar in a small bowl. Place steak in a ziplock bag, pour the marinade over it. Massage the marinade into the steak for about 5 minutes and then refrigerate for at least 30 minutes and up to 4 hours. Heat a cast iron skillet over medium-high heat, or a grill to medium-high. Remove the steak from the marinade and sear for 3 to 4 minutes per side for medium-rare, or until desired doneness. Remove from heat and allow to rest for at least 10 minutes. If using a larger cut to divide, slice across the grain to serve. 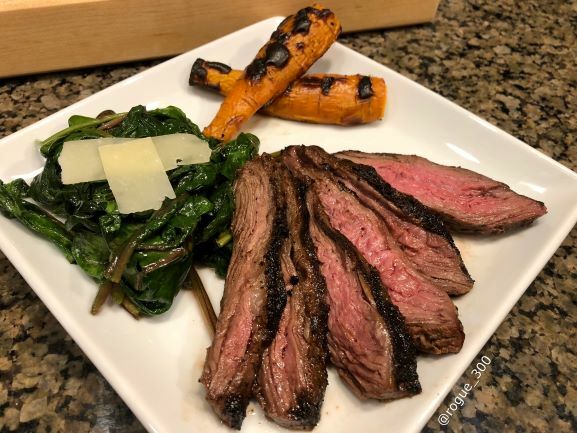 Pictured is a skirt steak served the with sides of vegetables for dinner one night, and a couple of days later I used the leftovers over salad greens for an entree salad. 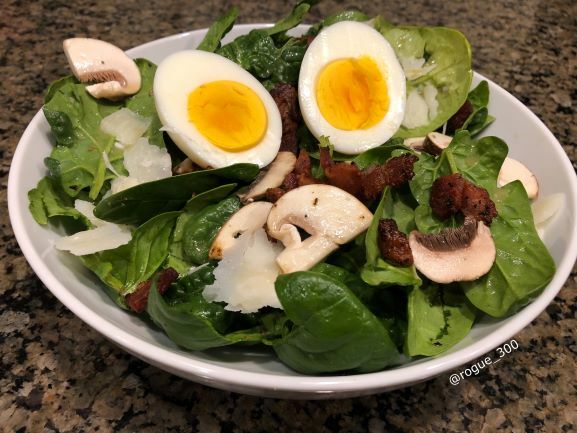 This dinner salad is perfect for a night when you want something a bit lighter, are pressed for time or simply want to enjoy the simple beauty of local ingredients from our producers. In a medium-size nonstick skillet, fry the bacon pieces until crispy. Remove to a paper towel lined plate and set aside. In a large bowl, whisk together the vinegar, honey, mustard, salt, pepper, and spice blend. Taste and adjust seasonings to your preference. Add the spinach and sliced mushrooms; gently toss to coat. 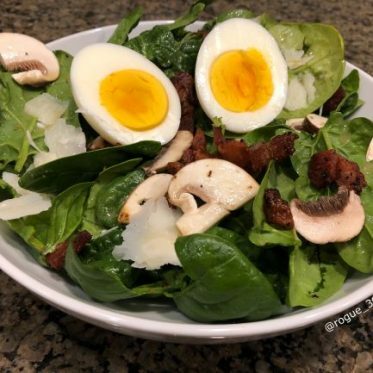 Divide the salad between two bowls, sprinkle in the bacon, and garnish with the eggs and Parmesan, if using. Winter is finally leaving! The transition from winter to spring always makes me happy, however this year, it’s making me downright ecstatic since it seemed as if it would never stop snowing or get warm. 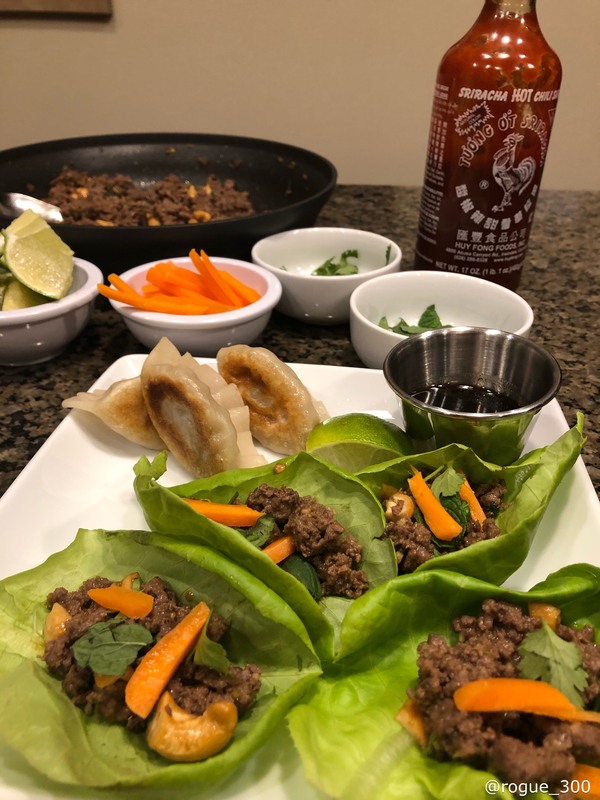 Join me in welcoming spring with these colorful, delicious, and easy to put together Thai Lettuce Cups. Pair these with pre-made dumplings for a complete dinner that’s on the table and ready to enjoy in under 30 minutes. Heat oil in a large skillet over medium heat. Add the onion and cook until soft, about 4 minutes. Add the garlic and ginger, cook 1 minute longer. Increase heat to medium-high and add the ground meat or chopped mushrooms. Cook for 3 or 4 minutes, breaking apart the meat as it cooks. Add the soy sauce, fish sauce (or umami paste), brown sugar, lime zest, lime juice, and red pepper flakes. Continue cooking until meat is cooked through, or an additional 4 minutes if using mushrooms. Off the heat, stir in the scallion, cilantro, mint, and nuts. 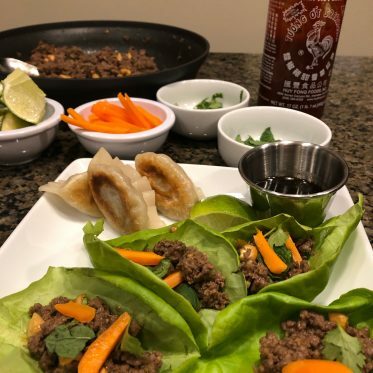 Spoon into lettuce cups and serve with garnishes and dumplings for an easy weeknight, or any night dinner or lunch. Leftover filling can be kept in the refrigerator for up to a week, or frozen for up to 3 months. Simply gently reheat on the stove top or in the microwave. In a 5-quart heavy bottomed pot, melt the butter over medium-low heat. Add the brown sugar, sorghum, and cream and stir together. Bring this mixture to a boil cooking over medium-low heat, stirring frequently to prevent scorching. Continue stirring scraping the sides with a silicone spatula to prevent crystals forming on the sides of the pot. Do not rush. Cook until the mixture reaches 248 degrees (hard ball stage). Cooking further could make the candy too hard. Pour the caramel into the prepared pan, and allow to cool in an undisturbed area for about 3 hours. 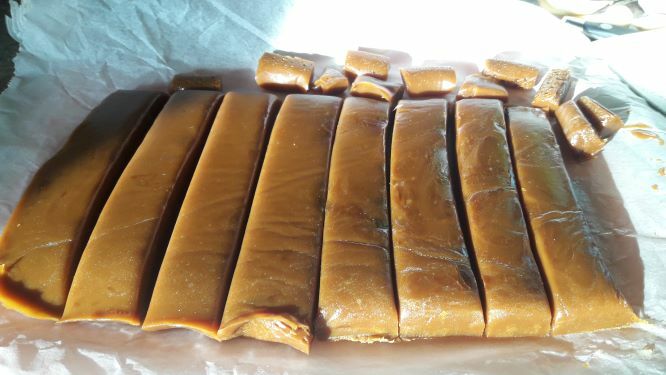 Once set and cooled to room temperature, lift the caramels out of the pan by lifting up the parchment paper edges. 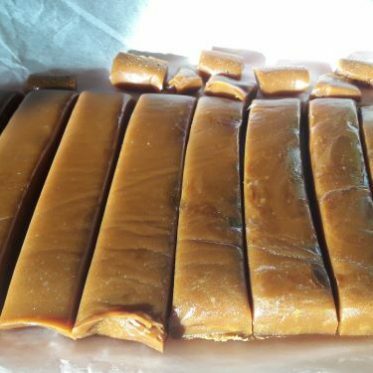 Flip the caramels over on to a clean cutting surface & peel off the parchment paper. Use a buttered knife to cut into bite size pieces & either wrap in parchment paper or dip in melted chocolate then place in mini cupcake liners for packaging. These should keep for several weeks in the refrigerator & months in the freezer. Life gets, well, busy. 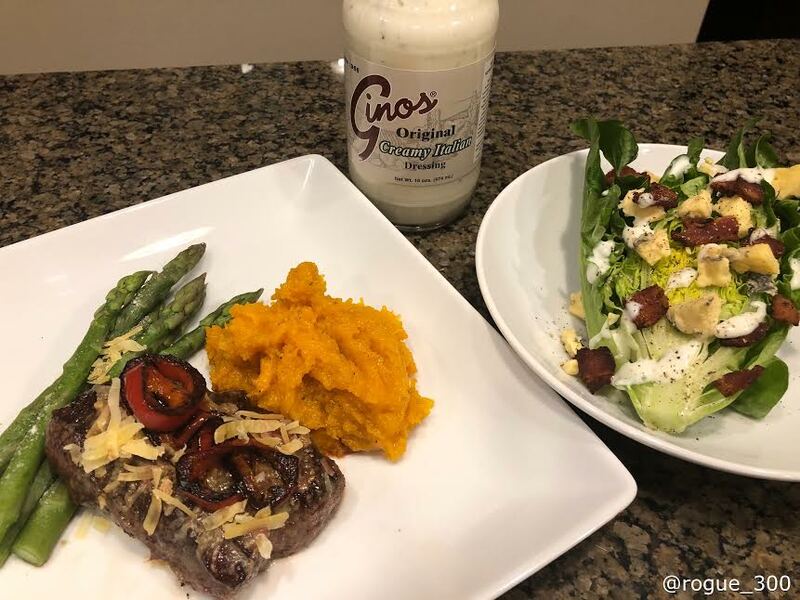 It seems as if we’re often running from one thing to another – work, errands, events – and it takes a toll, usually on the amount of time we have left to cook. Hey, I get it, and so do all the drive-thru places, take-out restaurants, and meal kit delivery services. Sometimes we want something quick and easy. 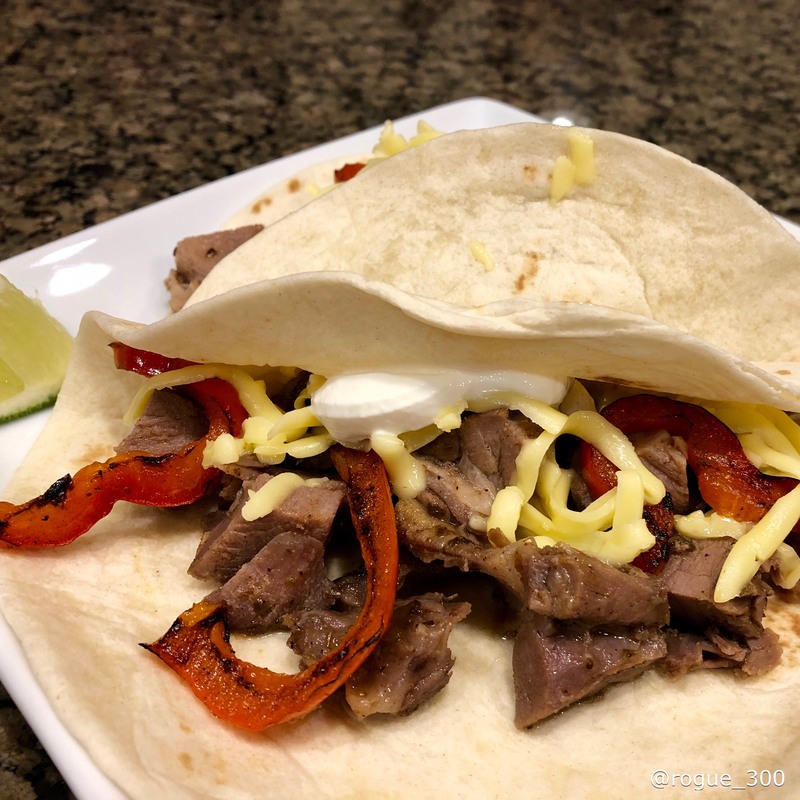 Well, here are 2 super easy meals and one snack (who am I kidding, I totally eat quesadillas for dinner on a regular basis) that you can have on the table in about the time it takes to get take-out and drive home. How? 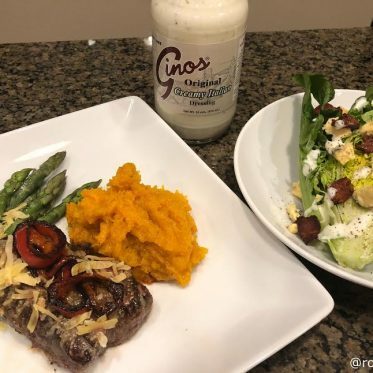 By cooking a chicken ahead of time (I frequently have cooked chicken in the fridge for quick dishes) and using some pre-made items from our wonderful producer, Des Fresh! Now who wants beef stir-fry with veggies, chicken fried rice, and chicken quesadillas? Yeah, me too! NOTE: for vegetarian dishes, you can absolutely substitute sliced mushrooms or tofu in place of the meat. In a medium bowl, mix together soy sauce, sherry, brown sugar, cornstarch, and ginger. Set aside half of the liquid, add the sliced beef to the bowl and toss to coat well. Heat oil in a large skillet or wok over medium-high heat. Add the vegetables in batches – heavier, courser vegetables such as carrots, peppers, and celery should be added first, followed by mushrooms – broccoli and snow peas should be added last to prevent overcooking. Stir the vegetables frequently and cook until tender-crisp. Remove to a clean plate or bowl. Allow the pan to get hot again, then add the beef in small batches, being careful to leave most of the marinade in the bowl. Allow the meat to cook for a minute or two before stirring. Turn or stir, to cook both sides – about 2 1/2 to 3 minutes total time. Remove to a separate bowl and repeat with remaing beef. When the last batch of beef has been added to the skillet, return the cooked beef to the pan, followed by the vegetables. Pour the reserved marinade over everything and allow to cook, stirring constantly for about 30 seconds. 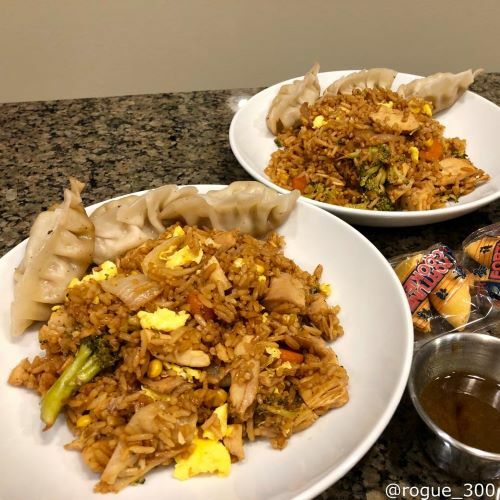 Serve immediately with fried rice and dumplings for a complete Asian-style dinner. In a large skillet sprayed with cooking spray or misted with oil, scramble the egg over medium-low heat & then remove to small dish to be used later. To the same skillet, add the precooked fried rice, chicken, and 2 TB soy sauce. Gently warm the rice, stirring frequently and adding additional soy sauce if needed. Once the rice and chicken are completely warmed, about 10 minutes, gently stir in the scrambled egg. Serve with dumplings for a complete Chinese take-out style dinner. In a large skillet, heat the olive oil over medium heat. Add the onion and saute until soft – about 5 minutes. Add the garlic and cook for another minute. Stir in the chipotles, adobo, and tomatoes. Cook until the liquid from the tomatoes has evaporated and the mixture has thickened – about 15 to 20 minutes. Stir in the honey, chicken, scallions (if using), salt, and cilantro. Keep warm while you prep to tortillas. Heat a second skillet or griddle over medium heat, spray lightly with nonstick cooking spray. Lay a tortilla in the pan, and heat until hot to the touch, but not crisp. Flip the tortilla over, then sprinkle with shredded cheese. Once the cheese is mostly melted, spoon the chicken mixture on half of the tortilla and fold over. Continue cooking until the tortilla is crisp, and then flip over to crisp the other side. Remove from the heat and allow to rest for 2 or 3 minutes before cutting into wedges. 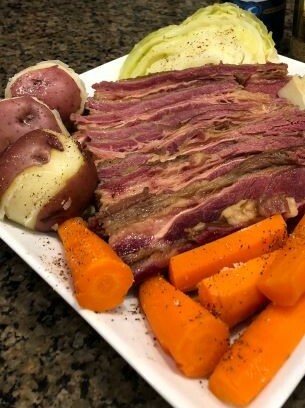 Corned beef and cabbage – ah, the quintessential Saint Patrick’s day fare! With this easy recipe, there’s no need to shy away from making this staple at home. The brine does all the heavy lifting, and since it can cure in as little as 2 days (though 4 is much better) it doesn’t require too much advanced planning. So pull up a stool, breakout the shamrock’s and enjoy this dish at home. To cure the beef: Trim all but 1/8″ of fat from the outside of the brisket. Add 4 quarts of water to a large container (should be large enough to completely immerse the brisket). Add the curing salt, salt, and brown sugar – stir until everything is dissolved. Add 3 garlic cloves, 4 bay leaves, allspice berries, 1 TB of peppercorns, and coriander seeds to brine. Add the brisket and weigh it down with a heavy plate. Cover and refrigerate for 2 to 6 days. The meat will turn gray on the outside, but will change to pink when it’s cooked. Preheat oven to 275 degrees. Remove beef from the brine and rinse. Make a spice bundle by stacking 3 8″ squares of cheesecloth and placing 3 garlic cloves, 2 bay leaves, and 1 TB of peppercorns in the center. Tie the bundle securely with kitchen twine. Place the brisket, spice bundle, beer, and 1 1/2 cups of water in a heavy dutch oven. Over high heat, bring everything to a simmer; cover and transfer to the oven. Bake until a fork easily slides into the meat – about 2 1/2 hours to 3 hours. Remove the brisket to heat safe, covered, baking dish, and add 1 cup of cooking liquid. Transfer to the oven to keep warm. Add a steamer basket to the Dutch oven and place over high heat. Once the liquid is boiling, reduce heat to medium-low and add potatoes. Cook for 5 minutes, covered. Add the carrots and cook, covered for another 5 minutes. Add the cabbage wedges and cook for another 10 – 15 minutes, or until the cabbage is cooked through. While the cabbage is cooking, slice the beef, across the grain in 1/4″ – 1/2″ pieces. Transfer to a serving platter and slightly moisten with cooking liquid. Transfer the cooked vegetables to the platter; season with salt and pepper to taste. Serve with mustard or Irish soda bread for an authentic Saint Patrick’s Day meal. Who’s ready for some football? Whether you’re cheering for the NE Pats or the LA Rams, you and your friends will surely be cheering for these easy to make, great to eat nachos & tacos. Grab a few friends, your favorite beer, and get ready for kick-off because this recipe can easily be made the day before and warmed up in crock pot for the big game. In a small bowl, combine oregano, cumin, chili powder, salt, pepper, garlic, olive oil, white wine vinegar, brown sugar, and onion. Mix well – if you’re using garlic cloves or a whole onion, puree everything in a blender. Pour mixture over meat, coating all sides. Either preheat oven to 300 degrees, place coated meat in a Dutch oven, and pour 2 cups of water into the pot. Cover and roast for 5 hours, or until meat is fork tender. Alternatively, place meat in a crock pot with 1/2 cup of water, and cook on low for 8 to 10 hours. This can also be made in an Instant Pot, by using 1 cup of water and cooking on high pressure for 75 minutes, with a natural pressure release. Remove the meat, shred or cube, and then return to the liquid to prevent drying out. Serve as pork tacos, over nachos, a mixed salad, or in lettuce cups with your favorite toppings. Squeezing a bit of lime over it before serving, gives it a nice, fresh, pop of flavor. 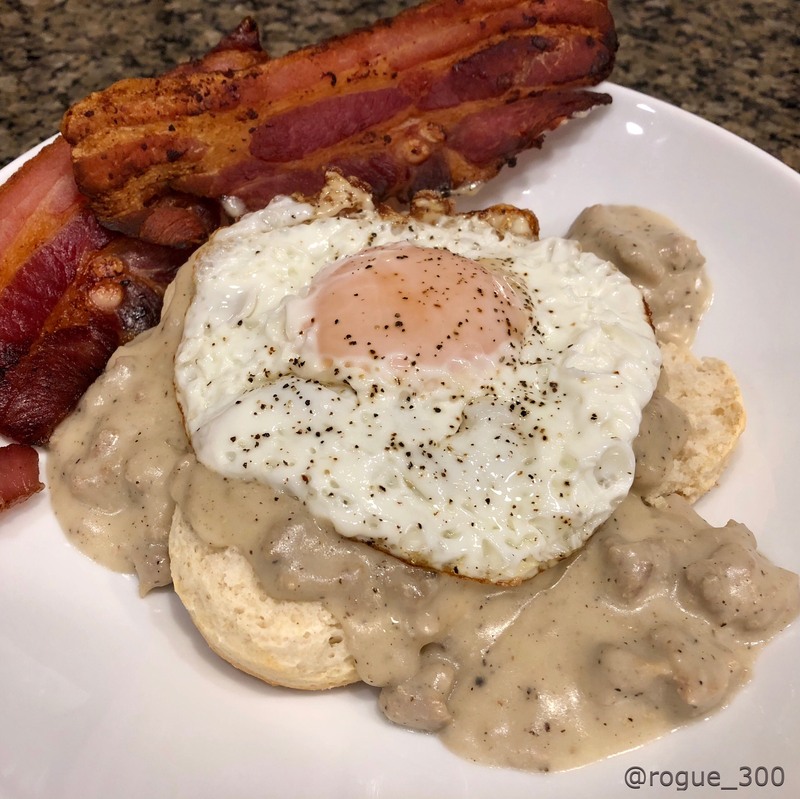 You don’t need to live on a farm to enjoy a farmhouse breakfast. This sausage gravy is perfect for a weekend brunch, a weeknight breakfast-for-dinner, or make a batch over the weekend, and then reheat it for a quick breakfast during the week by simply adding a splash of milk before reheating. In a large skillet over medium-high heat, break apart the sausage and cook through. If using chicken sausage, add 1 TB of cooking oil. Sprinkle in the flour and stir to coat the sausage. If you’re using chicken sausage, and it’s too dry, add a bit more oil and stir until the flour is thoroughly coating the meat. Allow to cook for about a minute. Slowly stir in the milk, 1 cup at a time, stirring to combine after each addition. Stir in the seasoned salt and 1 1/2 tsp of black pepper. Reduce heat to a simmer and allow to cook for 10 to 15 minutes, or until it reaches desired consistency. Taste for seasoning and add more if needed. If the gravy gets too thick, and in a bit of milk and stir. Serve over warm biscuits with eggs and bacon for a complete farmhouse breakfast. Leftovers can be frozen for several months – simply thaw, add a splash of milk, and reheat. Using a hand or stand mixer, whip the heavy cream, vanilla, and powdered sugar until stiff peaks form. Set aside until serving time. Combine the egg nog, rum or bourbon (if using), milk, eggs, cinnamon, nutmeg, and vanilla extract. Whisk until the eggs and milk are completely combined with the egg nog. In a large skillet or griddle over medium heat, melt about 1 tsp of ghee per toast slice. 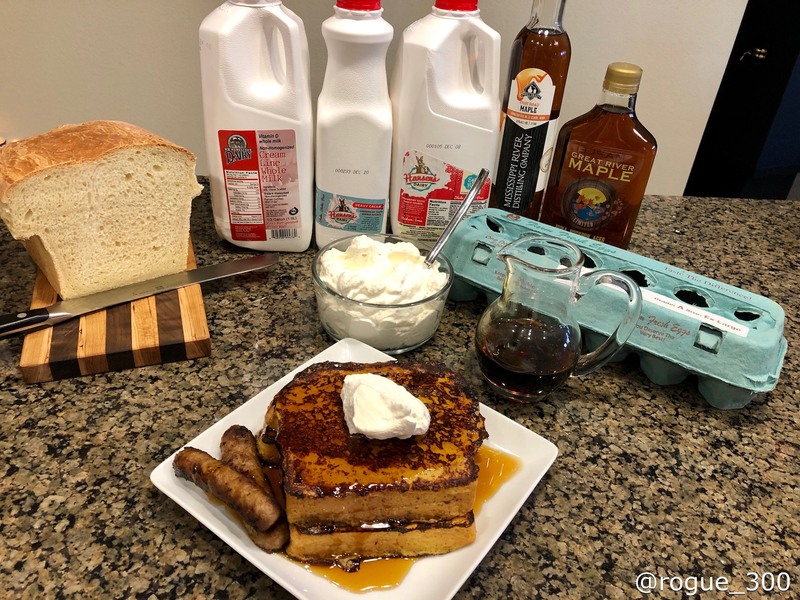 Dunk the bread slices into the egg nog mixture and allow to soak for 10-15 seconds per side (more or less depending on how you like your toast - though the longer it soaks, the more batter you'll need). Place in the skillet and cook until lightly golden brown on each side - about 2 to 3 minutes per side. Serve topped with maple syrup and fresh whipped cream.